We're almost 48 hours to landing. Atlantis is scheduled to land 09:41 am EDT (GMT-5) in KSC on orbit 171. 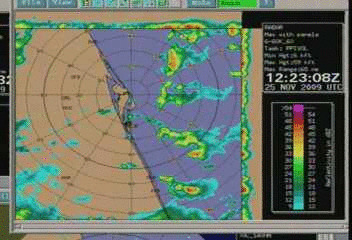 I got no info on forecasts, so to start the topic I'll just upload the actual radar image of the KSC area. There will not be any picking and choosing of the runway - that's a given with the wind forecast. We're looking at winds from the northwest at 10-20kts with the possibility of slightly higher gusts, but since there doesn't look to be much crosswind component at all I don't see an issue. As in the runway selection is up in the air or it's already chosen? If winds are from the northwest, wouldn't that push them to pre-select three-three? Sorry if this seems like a dumb question but I'm a bit confused. As in the runway selection is up in the air or it's already chosen? If winds are from the northwest, wouldn't that push them to pre-select three-three? It's the latter, for basically the reason you note (to land into the wind). Very good, then. Thanks for the clarification, Philip. Nothing new from my vantage point... Mostly clear, a little cool (by Florida standards, I've got flurries coming here!) with a gusty northwest wind. I am headed down to Titusville in the morning and was curious as to where I should watch from, I was like to get shots of it approaching and banking, etc. Would the drawbridge towards the entrance of Merritt island or Kennedy space center visitor complex be better. Does anyone know how it will approach? Thanks guys! Looks like the Nasa Causeway or even Port Canaveral would be the best place I'd say, thanks! I would opt for the visitors center parking lot. That is about as close as the public can get for a r/w 33 landing. You will hear the twin booms as Atlantis passes overhead just before they start their turn on the heading alignment circle. FYI, this discussion can take place in the STS-129 viewing thread (http://forum.nasaspaceflight.com/index.php?topic=19000), this is the weather thread. 7:55am EST -A few thin cirrus at 31000ft, winds out of the northwest almost right down the runway at 15G23mph. 8:55am EST - few thin cirrus clouds at 31,000ft. Winds from the northwest at 15G24mph.